Moves by State Graph: This week we published an awesome visualization tool - a Move by State Graph! When TrueNCOA finds an 18-Month or 48-Month move for one of your records, we provide you with the updated address. We refer to the original and updated addresses as the Historical and the Current addresses respectively. Each of these addresses are identified on the Moves by State Graph. Historical addresses are represented by the red bars and current addresses are represented by the blue bars. 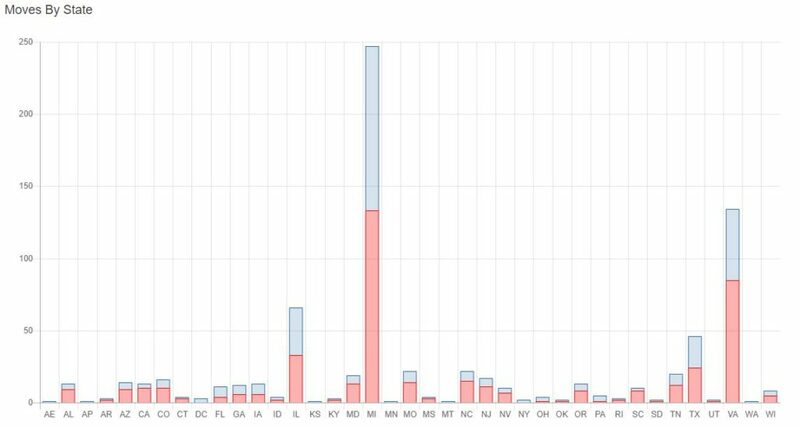 The Moves by State Graph uses NCOA data to show which state most of your prospects and donors are moving from and moving to. Share Your TrueNCOA Report: We added a share button to the TrueNCOA Report. This enables you to easily share the report with colleagues. Navigate to the TrueNCOA Report on the file display page, click the TrueNCOA Report header (this is a URL and will open the report on a new tab), and click on the share button. A form will popup allowing you to enter in an email address and optional message. Then click submit and the report will be sent via email. Total Credits Required Display: We added a function to tell you how many credits you need to download your file. You can find this at the top of your export page. Credit Refresh: Some users were experiencing an atypical outcome after downloading their files. When using the Mozilla Firefox browser, the credit counter in the app's top navigation was not refreshing as expected. While TrueNCOA was charging the normal single credit for the download, the counter was refreshing to show that there were 0 available credits for the account. This did not reflect the actual amount of credits deducted. We have updated the app to better handle how we display credit deductions for Firefox users. Now, when you download your file your credit counter will show the appropriate number of credits (one) was deducted.